Worldwide sales of books is growing until 2019, at least. That’s the number one conclusion from the report Global Entertainment and Media Outlook 2015-2019 by PWC that quantifies the whole global book industry. Number two conclusion is that the engine of growth is ebooks because the sales of print books is declining. The third point is that tablets are an important driver for ebook adoption. PWC is a global consultancy whose report may be purchased directly from the company web site. We have extracted some highlights from the report. The whole global book industry (consumer books, educational, professional and science books) is expected to reach USD 128 billion in sales by 2019. In 2014, sales was USD 120 billion. The compound annual growth rate (CAGR) is expected to be 1.3 % in 2015-2019. For a business that’s hundreds of years old, and going through its biggest disruption since the invention of printing press, growth rate like 1.3 % is simply remarkable. The report anticipates that the sales of consumer books will grow 0.8% (CAGR) by 2019. Towards the end of the period, ebook sales is expected to ramp up. The reason why consumer book sales is growing slower than the whole market is that educational books are growing faster than the market. 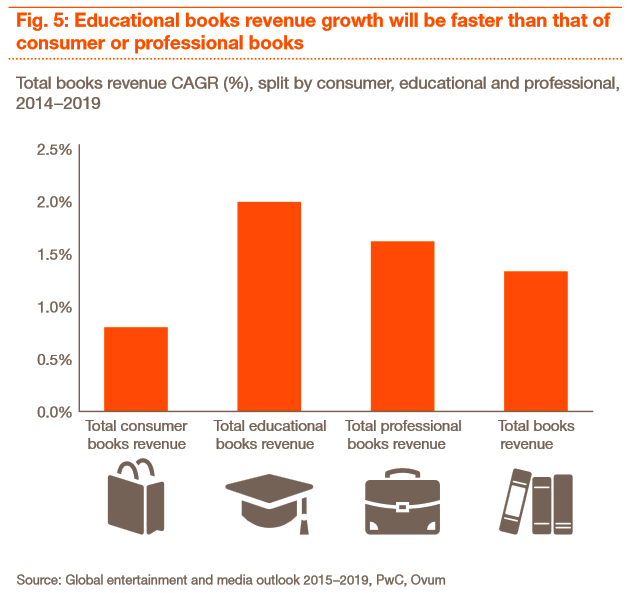 The sales of educational books are expected to grow 2.0% (CAGR) globally, and professional books 1.6%. Strong growth for educational books is driven by two factors: ebooks are being widely adopted, and print books continue to sell well. 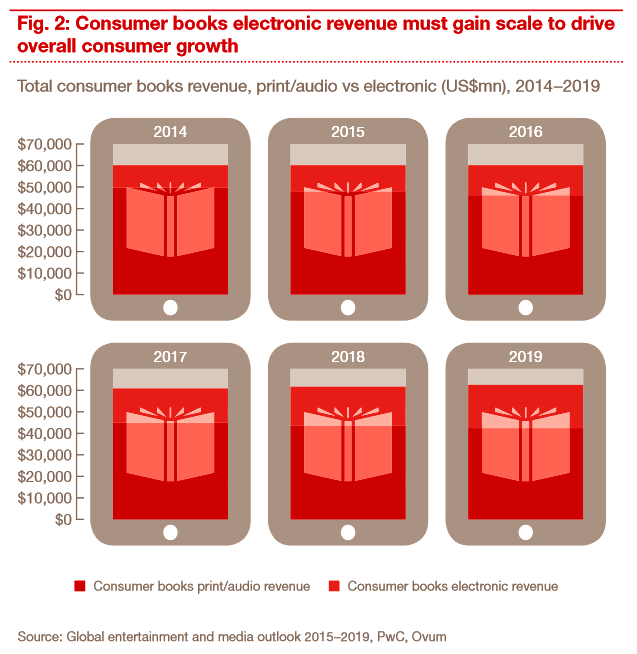 PWC consultants have made an interesting conclusion on the reasons that are driving ebook sales. Their conclusion is that ebooks will be adopted in those countries where tablet penetration rate is 50% or higher. The popularity of ebooks in the US, UK, Canada, Singapore and South Korea prove the point, because tablet penetration is high in these countries. 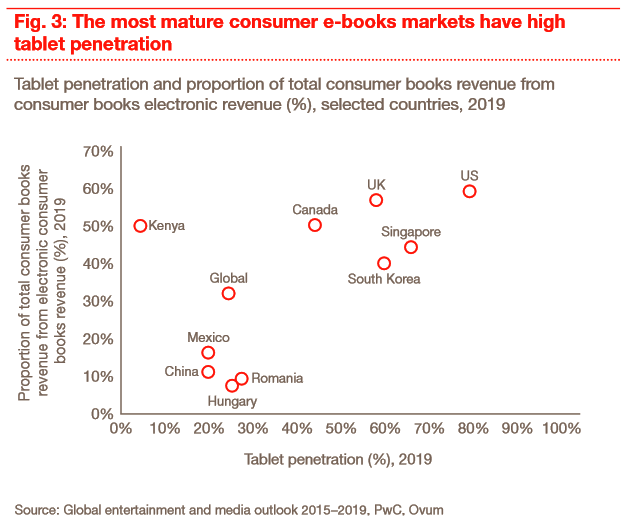 PWC expects that ebook market share will reach 40% by 2019, accelerating book industry growth in these countries. 2015-06-22 by Klaava in Books. Tags global, markets, PWC, report, sales.